I am not a fan of the “Columbo” method of mystery writing. While it worked well on-screen for Peter Falk, as far as I’m concerned, if you let the reader know the identity of the villain at the top of the story, it’s no longer a mystery, but rather a thriller. I much prefer a mystery where the reader is given as much chance as possible to discover the culprit before the author gives us the big reveal. Even Sherlock Holmes, who almost invariably had things solved well before the end of the story, let the reader follow along without knowing until the last second–whodunit? 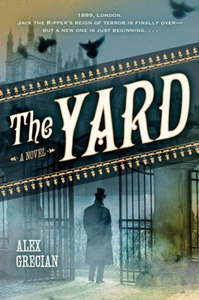 So, I expected to be much disappointed with Alex Grecian’s The Yard, a novel where the identity of the culprit is known within the first few chapters. However, extenuating circumstances turned what could have been a straight out thriller into a nicely rounded mystery. First, let us set the scene. The year is 1889, and it’s been a year since Saucy Jack, a.k.a. Jack the Ripper has haunted the streets of Whitechapel, carving up prostitutes and taunting the good detectives of Scotland Yard to stop his reign of mayhem. Detective Inspector Walter Day is on his first week of service with the Yard, and catches his first case—the murder of a fellow detective, stabbed and left in a trunk on the platform of one of London’s busiest transit stations. It’s a situation that’s doubly uncomfortable for the newly minted detective, feeling the pressure to both impress his fellow detectives and to solve the murder of one of Scotland Yard’s own. Thrust into a situation that would test the mettle of even a seasoned detective, Day follows the forensics, with the help of Dr. Bernard Kingsley, coroner and advocate of this new field of scientific inquiry. Has Saucy Jack returned? Or is there a new madman haunting the streets of London? Day and Kingsley resolve to find out before the killer strikes again. Intertwined with Day’s story is that of Constable Neville Hammersmith, obsessed with his own inquiry into the death of a chimney sweep’s assistant, a five year old boy left to die trapped in a flue when he becomes stuck. Hammersmith is met with derision by the detective assigned to the case, who would rather chalk the enquiry up to “death by misadventure” rather than pursue the chimneysweep who left one of London’s child labourers to die alone in the dark. Hammersmith refuses to let the matter go, spurred by his own experiences as a child in the coal mines of Wales and his desire to punish those that would use a child as a tool to be thrown away when broken. 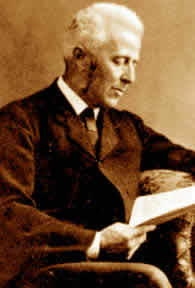 When his own inquiry involves the prominent doctor whose house the dead child was discovered in, a series of events is unleashed that eventually involves Hammersmith in the lives of Day and Inspector Michael Blacker, their work on the murder of Inspector Christian Little, and a third set of murders that Blacker is convinced Little was close to solving when he met his end. The Yard is split into several narratives, written from the point of view of the various detectives, constable Hammersmith, Doctor Kingsley, and, interspersed throughout the story, the murderer, allowing us as readers some insight into the killer’s motivations. However, very early on the identity of the murderer is revealed to the reader—we’ll call that the “Columbo Effect”—something that usually ruins the mystery for me as a reader. I like a mystery to be a mystery, and once you know who the murderer is, as I said earlier—that’s a thriller. Grecian manages to save the mystery aspect by very deftly intertwining a series of actual mysteries into the narrative, and providing motivation for the villain’s crime from his/her point of view. It’s very much the Columbo method/effect, but the author manages to make it work. Conan Doyle when he created Sherlock Holmes. Back to Kingsley—he’s also a pioneer in the field of forensic pathology, and when the reader first meets him, he’s elbow deep in an autopsy, with his daughter (and assistant) drawing diagrams of the procedure for future reference. Alex Grecian also gives a patina of authenticity to this Victorian mystery with the inclusion of many subtle examples of life in Victorian England. Hammersmith and his roommate, constable Colin Pringle, share a room due to their relative poverty and ration both food and second hand tea (infused with copper to give some semblance of taste) simply to get by. The author also gives insight into the use of child labour at the time, whether it be as chimney sweep assistants or working in the mines, and demonstrates the obvious lack of social services for the poor or mentally ill. 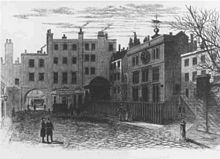 The climax of the novel takes place round and about one of the many workhouses that dotted London at the time, and provides a look at the squalid conditions of life in Victorian London, juxtaposed with the relative opulence of life amongst the upper crust of society. Even the murder squad at Scotland Yard is shockingly deficient. Composed of a small unit within the metropolitan police force, it’s hard to imagine the evolution of such a ragtag bunch of detectives into the cultural and investigative icon of today’s Scotland Yard. My final analysis—The Yard is more thriller than mystery, but Grecian manages to weave enough of the investigative process into the novel that the reader is able to overlook the premature reveal and end up with a ripping good read. 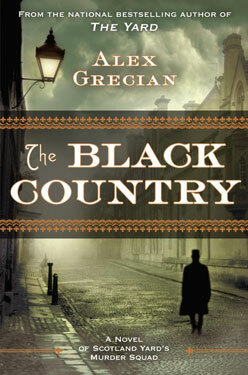 I look forward to the sequel, The Black Country, out in Hardcover now. Alex Grecian maintains a website at alexgrecian.com. About five years ago, a title leaped out at me from the shelf as I walked through my local bookstore. The Court of the Air by Stephen Hunt, described on the dust cover as, “A fantastical tale of high adventure, low-life rogues, and orphans on the run.” Now I’m a sucker for both fantasy and adventure novels, especially those with a historical feel, and a quick read of the synopsis suggested that this novel could be all those things, with the added bonus of being Steampunk. At the time, I set it back down, thinking to pick it up at a later date–and then promptly forgot it. Flash forward a year and the same title once again leaped out at me while strolling through another bookshop. It also leaped out in hardcover for an absolutely reasonable price. So, I bought it, set it on the shelf with the intent to read, and there it sat until earlier this year. When I finally got around to reading it, I realized that I’ve been missing out on the Steampunk equivalent of J. R. R. Tolkien or George R.R. Martin. I also realize that if I missed out on this for six years, you might too, and we can’t have that. So, synopsis please, and we’ll go from there. The Court of the Air is nominally the story of two orphans, one being the foundling Molly Templar, a street urchin left to the care of the Sungate workhouse in Middlesteel, capital of the nation-state of Jackals. The other, one Oliver Brooks, is also an orphan after an Aerostat crash into the feymist (magical faerie mist is the only way I can describe it) that blankets parts of Jackals killed his parents and left him alone in the world except for his uncle Titus. Life is hard for both Molly and Oliver. She goes from job to job, the proceeds confiscated to pay for her care at the workhouse until she comes of age and finds a career, while he is ostracized by the community and forced to register with the worldsingers (a type of magician) every week to prove the latent mystical powers they suspect he has as a result of his time in the feymist have not manifested. When everyone in Molly’s workhouse is slaughtered by a mysterious assassin, and Oliver’s uncle is murdered in his house and he subsequently framed for the crime, both go on the run and into a series of adventures that will eventually bring them and their stories together—and may possibly rip both the state of Jackals and literally their entire universe apart. That is, unless they can find a way to stop it. 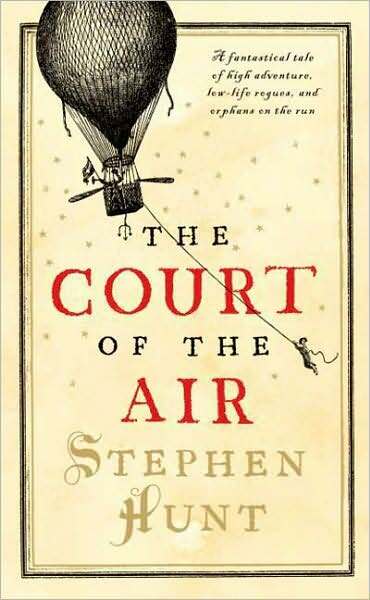 The Court of the Air is a novel of intrigue within intrigue, with many factions on the trail of the two orphans, some to protect them, others to stop them from fulfilling a destiny they aren’t even aware of. It’s also a masterful blend of both Steampunk and something somewhat unique to the genre. Sure, it was quite obvious in the opening pages that there would be the traditional Steampunk fare: Autonomous Steam Men, Aerostats (also known as Zeppelins), Pneumatic Buildings and Subterranean Cities, but what piqued my interest was the addition of magic. Elements such as the Feymist (faerie) creatures, the Special Guard (those augmented by their exposure to the world beyond), Worldsingers (magicians who utilize the power of the earth in their arts), even the militia’s muskets relying on crystals grown for use as a sort of magical gunpowder, all add a mystical element to a genre that (I think) is not generally known for it. I would be remiss at this point not to mention the Court of the Air itself, an organization whose existence is whispered amongst the people but rarely seen. A shadowy league, influencing significant events from behind the scenes for their own altruistic–or nefarious–purposes. A cabal to whose attention Oliver and Molly have unwittingly come. There are times in which The Court of the Air can be a tricky read. Stephen Hunt has managed to create a universe with its own particular accent, especially with regards to the language. The novel is chock full of Jackelian slang. As an example, Crushers are police, Wordsingers are magicians, even the honorifics mister and missus become Samson and Damson. Many times while reading The Court of the Air, I wished for a dictionary of Jackelian vernacular, but much like a Dickens novel, you get used to it, and it gives the novel a particularly strong air of authenticity. Speaking of Charles Dickens, Hunt’s work has much the same feel, writing of orphans and workhouses, characters with a hidden destiny, a gentrified society of haves and have-nots, and all wrapped in wonderful prose of a decidedly Victorian flavor. Hunt’s Universe is also very obviously a blending of English history and Steampunk fantasy, what with the Kingdom of Jackals being nominally a constitutional monarchy that has neutered the power of the King after a conflict reminiscent of the English Civil War. Even the troops carry weapons that nod to their historical counterparts. The New Pattern Army of Jackals recycles a variation of Oliver Cromwell’s New Model Army, and its soldiers are loaded out with a musket called the Brown Jane, recalling the real life Brown Bess. Calling the militia Redcoats simply completes the picture. However, the automaton Kingdom of Mechancia and the evil shadows of the Wildcaotyl bring both a Steampunk and fantastical element to Jackals history. Even the political ideologies of the major factions are patterned on historical examples. Jackals is a social democracy where parliament rules with a king as figurehead only, while their enemy, the Commonshare of Quartershift is an obvious allusion to both the former Soviet Union and the ideology of Communism. Within Jackals itself, there is a debate between the accepted state of society and the criminalized works of Benjamin Carl, a Marx-like figure whose treatise, “Community and the Commons,” sparked a failed revolution years earlier. This spectacular novel does take a while to become fully immersed in, what with the learning curve of both the colloquial slang and the sheer size of Hunt’s universe. In the final analysis, The Court of the Air is a novel that you don’t so much read as you do explore. And that makes for a wonderful novel that deserves to be the standard to which other Steampunk novels be compared.